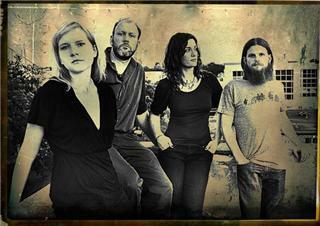 Crooked Fingers is a North Carolina band led by former Archers of Loaf lead singer Eric Bachmann. The band was previously based in Seattle, Washington and Atlanta, Georgia before moving to Denver. The band released albums on WARM Records and Merge Records before going completely independent in 2008. They tend to have a rotating lineup. Following the breakup of Archers of Loaf in 1998, Bachmann started work on a solo project that he named Crooked Fingers. The first release of this project, a self-titled release of various songs he had written, was released by WARM in 2000. It was followed shortly after by a second album on WARM, Bring on the Snakes. Following the release of Bring on the Snakes, Crooked Fingers signed to Merge. Under that label, Crooked Fingers released Reservoir Songs EP in 2002, composed of cover songs of artists such as Neil Diamond and Queen. In 2003, they released Red Devil Dawn, their first full-length for Merge. They released Dignity and Shame in 2005. In October 2008, the band released a new album, Forfeit/Fortune. The band declined to sign a deal with any label, pursuing a direct-to-retail approach supported by sales at shows, the band's website, iTunes, and eMusic. Crooked Fingers has toured the United States, Canada, Europe, Japan, Australia, and New Zealand, both as a solo act and with a full band. They were featured on KCRW's Morning Becomes Eclectic and on National Public Radio's World Cafe in May 2005. On the 2005 U.S./Canada Tour, Matt Gentling, former member of Archers of Loaf, played the bass. The rotation of members in the band have included such musicians as Lara Meyerratken, R.L. Martin, Jo Jameson, Neil Swank, Barton Carroll, Kyle Johnson, and Dov Friedman. A 2008 US tour featured the musicians on Forfeit/Fortune: Miranda Brown, Elin Palmer and Tim Husmann.